We trace our lineage through the Western Branch of Christianity to the earliest days of the Church, hold to the ancient Creeds, practice the ancient Sacraments, and retain the Apostolic Succession of Bishops, Priests and Deacons. Christianity arrived in the British Isles in the second century, and a flourishing Celtic Church was well established by the time Pope Gregory sent Augustine to become the first Archbishop of Canterbury in 597 A.D. This situation prevailed until the break between the Anglican Church and Rome at the time of the English Reformation. It was only after the break with Rome that our branch of the Catholic Church began to use the term “Anglican” in distinction from “Roman” Christianity. There are 80 million members of the Anglican Communion, the third largest Christian Communion (following the Roman and Orthodox churches) in the world and the largest Christian body in the English speaking countries. Each Province of the Anglican Communion is autonomous, and may not agree on every jot and tittle of the practice of Christian Faith. Yet, we all trace our lineage to the Ancient Church, as refracted through the evolution of the Church in the British Isles. 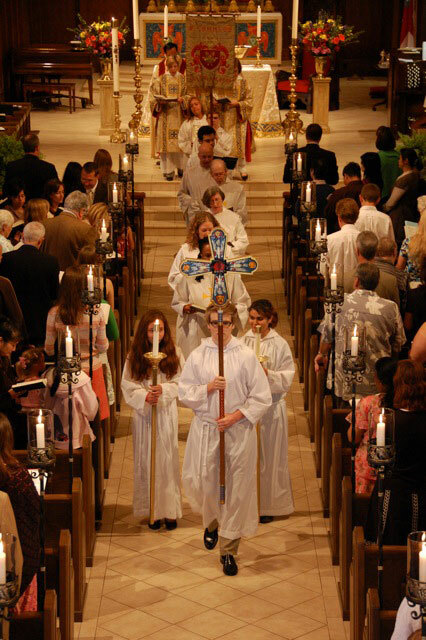 Differences between the Episcopal Church and the Roman Catholic Church: People often ask about the primary difference between the Roman Catholic Churches and the Anglican (Episcopal) Churches, and it must be said that the primary distinction is in the way authority is conceived and exercised . Anglican/Episcopal churches retain the ancient hierarchy, but also make room for a democratic structure and place great importance on the voice and power of lay men and women. This is especially true of the Episcopal Church in the United States . 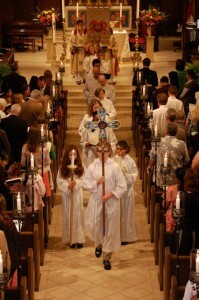 In consequence, the Episcopal Church differs from the Roman Church in our encouragement of birth control, our embrace of women clergy, our belief in the importance of individual conscience in matters pertaining to some of life’s most personal decisions and in many other practical applications of Christian Faith. There is great agreement between Roman Catholics and Episcopalians, however, on the central beliefs of Christianity. Saint Edmund’s is a Scripturally centered Church: We “believe the Holy Scriptures of the Old and New Testaments to be the Word of God and to contain all things necessary to salvation.” The Holy Scriptures form and shape us, and offer a lens through which we view and evaluate the world and all claims to truth. Like the Roman Catholics and the Orthodox Churches, we also draw upon the Apocrypha for wisdom. Anglicans are not literalist, or fundamentalist, in their reading of Holy Scripture. The Bible was written by human beings inspired by God, and the texts were collected, ordered and approved, also, by human beings. Scripture is not exempt from human frailty and imperfection. St. Paul , in his rousing affirmation of the place of Scripture in the pilgrim life said, “All Scripture is inspired by God and profitable for teaching, for reproof, for correction, and for training in righteousness” (2 Timothy 3:16 ). This we wholeheartedly believe and affirm. Holy Scripture then, is authoritative, not authoritarian and can never be read apart from careful interpretation. It is important to understand the cultural milieu in which Scripture was first written and important to avoid crude and simplistic contemporary applications. Scripture is a source of great light, the Church’s Book created by the Church under the guidance of the Holy Spirit to illumine the path we walk in commitment to God. Saint Edmund’s is a Thinking Church: Human beings are made in God’s image, and the light of God quickens conscience and intelligence and human will for the shaping of the world we live in. Episcopalians applaud the Enlightenment legacy, with its emphasis on critical and historical thinking, academic rigor, and a commitment to the sciences. As we continue to grow in our understanding of the origin and evolution of the earth and of the human species, of technology, medical advancement, and scientific insight, so God would have us hone our moral and ethical tools to grapple with issues raised by this deepened knowledge. Concern over environmental degradation, and the new terrain of genetic engineering are just two examples of the need to find wisdom as we meet the ethical challenges upon us. Such endeavor is central to our interpretation of the Christian Faith, and a rigorous commitment to the intellectual life is necessary for any faithful response. Saint Edmund’s respects Personal Conscience : Episcopalians say that a three-fold stool is required in order balance oneself in this complex world. One leg of that stool is Holy Scripture, the second is the Tradition of the Church, and the third is the light of Reason. As we exercise our Reason, we will not always find ourselves in unanimous agreement! That is to be expected. Deepened wisdom often flows from the tension between conflicting ideas which have been arrived at carefully, and which are held with respect for those who differ. The exercise of personal conscience is expected and respected in this parish, though it is also expected that conviction will be exercised thoughtfully, and with kindness and generosity toward one’s fellow pilgrims on the Faith journey.